Today's complexity of launching a product in the marketplace and delivering value to your customers cannot be managed as a linear set of phases, with little space to incorporate customer focus and adjust the plan along the way. It needs an iterative and adaptive development process. To properly understand customer needs, build a solution, and deliver a customer experience that satisfies those needs, product managers need to have a full vision of their product. This is what we call the “5D vision of great products”. 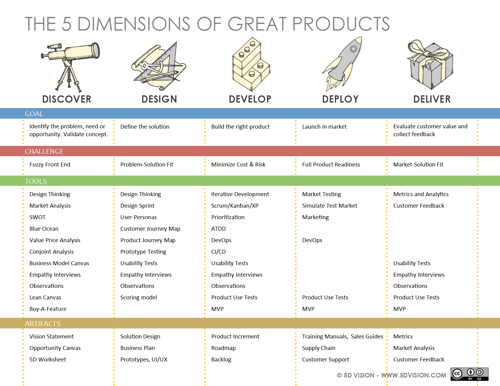 Product managers need to consider, plan, and execute in all 5 Dimensions to create great products. None of these dimensions is isolated from each other, and they may not even happen in linear order. In fact, you may return to any dimension at any time, and continue iterating through them, as you move forward in your ideation and development activities. The Discover dimension focuses on understanding the problem and customer needs, or identifying an unmet opportunity. Much like an explorer of old, the product manager uses the tools available to explore new areas, learn the terrain, and identify new opportunities. The goal of this exploration is the identification of a clear problem and opportunity worth solving. The Discovery of a new opportunity may come from a variety of sources including technology advancements (e.g. R&D in new battery technology at Tesla), a market change (e.g. financial incentives for Solar installations), a human need (e.g. social networking in Facebook), or the re-invention of an entire industry (e.g. Uber and Lyft’s transformation of the taxi industry). At the core of Discovery is the understanding of the needs, aspirations, and challenges of customers, and this places ethnographic research methods like Empathy Interviews and Observations at the center of this dimension. The Design dimension is dedicated to identifying a solution to the problem or need discovered in the previous phase. The goal is to validate an idea for problem/solution fit. Often, there is not a single, clearly defined solution, but rather there are multiple possible solutions. Prototype Testing and Design Thinking help you ideate solutions, narrow the possibilities, and validate your ideas using prototypes and user feedback. The Development dimension is when you work with your technology team to create your new product or feature. This is when the hard work put into the Discovery and Design phases come to life, in the form of an actual product that your users can interact with. The key activity here is to minimize risk and the cost of change by building the product in iterations and enabling your end users to inspect and provide feedback. Plans may adapt along the way, and you may pivot to Discover or Design a new idea if necessary. This kind of agility in development reduces the cost of change, and creates the foundation for a more successful end product. To help the team develop the right product and in the right way, at this stage you should focus on prioritization and keep your technical debt in check. If your goal is to launch a Minimum Viable Product (MVP) in the shortest time and with the fewest resources as possible, work with your cross-functional team and identify the key elements of your overall customer experience, including what you need in Deploy and Deliver. Focus on these elements, and delay everything else. Launching a product in market is probably the most exciting time for a product team. Deployment is a carefully orchestrated set of activities that happen in a particular order and that involve multiple teams. Deployment is not only the job of IT Operations, but is a cross-functional team effort. Team members from Marketing, Training, Customer Support, Sales, and other departments come together to orchestrate a successful launch of the new product. By focusing early on the Deploy dimension you can identify what you need for a successful launch across your multi-disciplinary team. You can start planning in the Design and Development phases, and in Deploy everything comes together as the cross-functional team works as a unit for a successful launch. The goal of a new product is to bring to life the initial promise set up by the product’s vision and satisfy customer needs and expectations. Just having a product in market does not represent success. Only when you can measure and validate the customer experience your product delivers, can you can measure success. The goal of this phase is to validate your market-solution fit through measurement and customer feedback. Because Delivery is the end goal of product development, the activities in this phase cannot be an afterthought. Proper planning in earlier phases for how you are going to measure and validate your product’s success is key to deliver a great product that customers love. 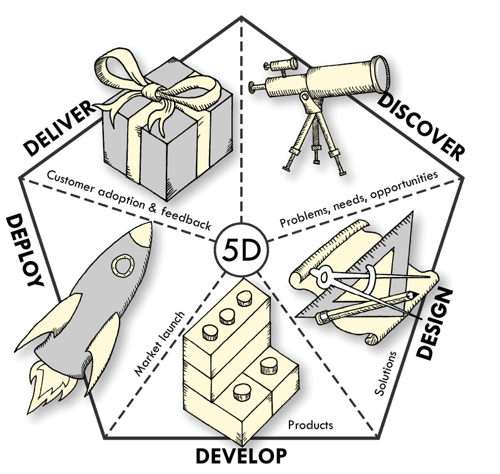 We have created the 5D Canvas to support product development across all 5 Dimensions. The 5D Canvas is both a reference and a tool to help you plan activities throughout the product development process.